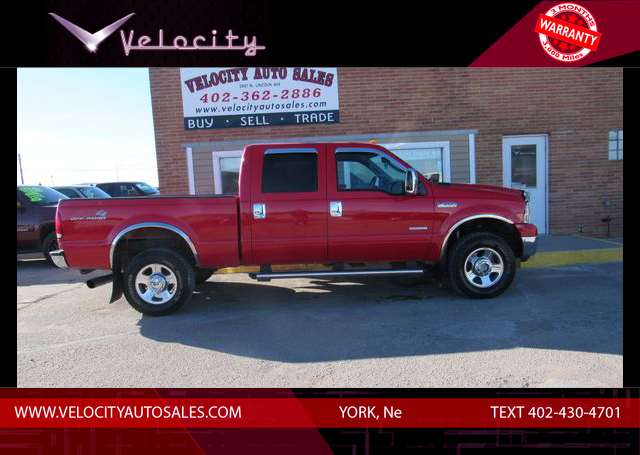 Red Clearcoat 2005 Ford F-350SD Lariat 4WD TorqShift 5-Speed Automatic with Overdrive Power Stroke 6.0L V8 DI 32V OHV Turbodiesel **3 MONTH/3000 MILE WARRANTY**, **LEATHER**, **HEATED SEATS**, **GREAT CONDITION**, **LOCAL TRADE**, **DIESEL**, **4X4**, **NO ACCIDENTS PER AUTOCHECK**, Power Stroke 6.0L V8 DI 32V OHV Turbodiesel, 4WD.It is Worth your Drive to buy from Velocity Auto Sales!!! Don't waste your time negotiating back and forth to get a fair deal, Instead Drive to York and visit Velocity Auto Sales, my prices are among the lowest in the market already! Our Vehicles come with a 3 month or 3000 miles warranty. Hours of operation are Monday thru Friday 9AM-530PM Saturday 9AM-12PM and by appointment evenings and Sundays. Call or Text Chad @ 402-430-4701. Price does not include tax, title or $99 admin fee. Odometer is 36548 miles below market average!This 2005 Ford F-350SD Lariat will not make it to the weekend!! CALL NOW to reserve your Test Drive appointment!! (402) 362-2886.